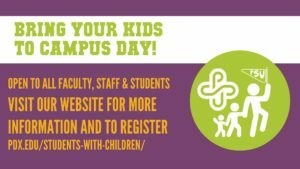 The University Library is pleased to participate in Bring Your Kids to Campus Day, sponsored by the PSU Resource Center for Students with Children, on Friday, April 13. PSU’s Bring Your Kids to Campus Day is a day-long, campus-wide celebration inviting students, staff, faculty, and their children to campus for events and activities. As a non-instructional day for Portland Public Schools, it’s the perfect opportunity for PSU parents to spend the day with their children. Stop by Room 160 in the Library in the afternoon, anytime from 2:30 to 4:30 p.m., to see some highlights from our collection of children’s books. We’ll also have coloring, button-making, and healthy snacks. This event is FREE for all students, staff, and faculty.